AS9100 was created by the aerospace sector to reduce variation in an industry that’s dependent on precision. As many management system standards--particularly sector-specific ones--have previously been a source of strict regulations and limitations to ensure product standardization, AS9100 has been able to achieve the same consistency while simultaneously allowing for flexibility of implementation. AS9100 is based on ISO 9001 and contains unique aerospace requirements but is not prescriptive in nature; this factor has been a major key to the standard’s success. AS9100 empowers users to develop aerospace quality management systems based on their product’s complexity and its criticality in relation to risk. For example, one organization could manufacture a bracket that holds tray tables in place, while another could produce complex avionics that keep the aircraft flying. These are different levels of complexity that require different levels of quality system intricacy. The beauty of AS9100 is that both of the above organizations can implement the standard, and the standard is adaptable enough to meet the needs of both companies. AS9100 enables suppliers to meet customer requirements and drive continual improvement without prescribing nonvalue-added activities. Configuration management for the avionics manufacturer requires significant levels of documentation incorporating many principles of CM. This is in great contrast to the bracket manufacturer, which would probably be concerned only with configuration identification and configuration control. That is the key to AS9100: It requires that organizations follow the standard only to the degree necessary to produce a quality product for the aerospace industry. The bracket manufacturer would never need to incorporate complex elements of CM, while the avionics manufacturer is dependent on eliminating the risks associated with these processes. The phrase “appropriate to the product, as applicable and where appropriate” are consistent throughout the standard where it pertains to aerospace-specific requirements. Product in the aerospace world is as diverse as black and white, and the nonprescriptive approach of AS9100 enables the standard to be used at all levels of the supply chain. Common goals of improved quality and safety, coupled with decreased costs due to the elimination or reduction of organization-unique requirements, are what will propel the aerospace industry through growth and stability. The true benefit of AS9100 is that it helps to accomplish this goal without being an implementation burden for organizations. Roger Ritterbeck is an AS9100 auditor, a QMI registrar aerospace technical expert and a member of the AS9100 rewrite committee. The 9100 standard is maintained by the International Aerospace Quality Group ( www.iaqg.org). In the United States, the standard is released by the Society of Automotive Engineers International as AS9100 “Quality Management Systems--Aerospace--Requirements.” It has also been released by other standards-developing bodies throughout the world and has differing designations dependent on the numbering scheme used by the releasing authority. For instance, the standard is known as EN9100 in Europe and as JIS Q 9100 in Japan. In nearly all cases, the standard retains the “9100” number in the various international versions. 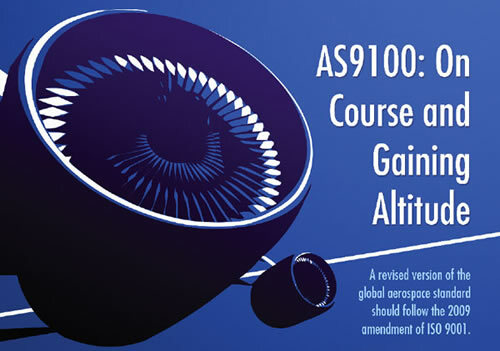 There are now regional and national versions of AS9100 published in Chinese, French, German, Hebrew, Japanese, Korean, Portuguese and Russian. AS9100 was first released in the United States in November 1999 and was based on ISO 9001:1994. AS9100A, released in 2001, retained essentially the same aerospace technical requirements but applied them to the new ISO 9001:2000 standard. The “A” revision divided AS9100 into two sections: Section 1, based on ISO 9001:2000; and Section 2, the older version based on ISO 9001:1994. Section 2 of AS9100A was to be retained only for the period allowed for organizations to transition from the 1994 to the 2000 version of ISO 9001. AS9100B was released in 2004 as an administrative revision to delete Section 2 of the standard. So, the aerospace technical requirements of the AS9100 standard have remained essentially unchanged since its release in 1999. ISO/TC 176, the technical committee that’s concerned with quality management and assurance, is now working on an amendment to ISO 9001:2000. Because 9100 is based on ISO 9001, a revision to the aerospace standard will also be required to reflect the changes made to ISO 9001. Additionally, user experience with 9100 has revealed improvement opportunities for the standard. The IAQG 9100 Team launched its revision initiative to update 9100 in October 2005, and works in parallel with the schedule established by ISO/TC 176 for amending ISO 9001. In November 2005, the 9100 Team met for three days to develop processes and a design specification for the revision project. It also identified stakeholders, and created a comments template and an online survey to obtain stakeholder feedback. The team developed a decision tree based on these factors and a benefits-vs.-impact matrix to use as tools while reviewing proposed changes. Two additional considerations were that the proposed changes mustn’t be prescriptive (i.e., establish “what,” not “how”), and that they were auditable. The design specification also directed that the 9100 standard would continue to overlay aerospace requirements onto ISO 9001; thus, the ISO 9001 text is sacrosanct. Any requested changes to ISO 9001 requirements are out of scope and won’t be addressed by the 9100 Team. Due to the global deployment and wide adoption of 9100, its stakeholder base is now considerably larger than when the standard was first published. Current 9100 stakeholders include not only IAQG member companies but also the global aerospace supply chain, the space and defense sectors, civil aviation authorities, national and regional defense authorities, certification/registration bodies, and other IAQG teams. Existing relationships between IAQG strategy and relationship growth teams and the stakeholder groups were leveraged, and stakeholders were invited to provide comments about 9100. An e-mail was sent to 9100-registered companies listed in the IAQG Online Aerospace Supplier Information System database ( www.iaqg.org/oasis), inviting these companies to participate in the survey. The data mining period, which extended from January 2006 until August 2006, garnered about 340 comments and change recommendations to 9100. The large number of comments received is a testament to the success of the data mining outreach and shouldn’t set off alarms in the user community: There won’t be 340 new requirements in the revised 9100 standard. Many of the comments were duplicative, and many won’t meet the design specification criteria; others are asking only for clarification of existing requirements. Although it’s too soon to forecast the number of new requirements that will appear in the revised standard, the number is expected to be relatively low. The 9100 Team met for three days in October 2006 to begin reviewing the data mining results, using the 9100 design specification criteria to guide the review. The team will continue this effort during its next meeting in Melbourne, Australia, in April. As a result of the initial reviews at the October meeting, subteams were formed to address areas that had numerous comments or that represented significant potential new requirements. These subteams will provide their recommendations to the full 9100 Team at the Melbourne meeting. The proposed changes to 9100 are varied. Many comments requested editorial clarifications. Other comments challenged the validity or benefit of some requirements and requested that a requirement be deleted or reduced in scope. Yet other comments requested the addition of new requirements, recognizing that continual improvement requires regularly raising the bar. Some of the items that were challenged were the aerospace requirements in subclauses 4.2.2 and 8.2.2. In subclause 4.2.2, “Quality manual,” users were having a difficult time understanding the intent behind the requirement to show the relationship between the standard’s requirements and documented procedures; in some cases this caused unnecessary, nonvalue-added work. In subclause 8.2.2, “Internal audit,” the aerospace requirement to measure the effectiveness of selected audit tools generally wasn’t understood, and even when it was, the cost often exceeded the benefit. In either case, auditability of this requirement is an issue. Both of these topics, as well as the other valid challenges to existing requirements, will be reviewed to determine if the requirements can be clarified, revised in scope or deleted. Multiple requests for clarification were received for the requirements related to “positive recall” in subclauses 7.4.3 and 8.2.4. These requirements, which can be traced back to a similar requirement in ISO 9001:1994, involve the release--under controlled conditions--of product prior to completing verification. The term “positive recall” often wasn’t understood, and these requirements will be revised to more closely align with the original ISO 9001:1994 text. The test report validation requirement in subclause 7.4.3 was another topic that received comments. Why did this requirement apply only to raw material? What constitutes raw material? What validation methods are acceptable? How often should validation be performed? There were many questions related to this requirement, and all are under review by the 9100 Team. Other items to be clarified include statistical sampling in subclause 8.2.4 (What’s statistically valid? What’s the statistical validity of this requirement as written? ), and first-article inspection (FAI) in subclause 8.2.4.2. (Is it necessary to perform FAI or only have a process for it? What’s a “part,” and does it include assemblies?) Clarifications were also requested in other sections of the standard--in particular, subclauses 7.3, “Design and development”; 7.4, “Purchasing”; and 7.5, “Production and service provision.” These requests are understandable, given the high number of aerospace requirements in these subclauses. 9100’s existing coverage for key characteristics was the subject of a number of comments, and this topic is also under review, particularly how to link 9100 with the IAQG-prepared 9103 standard (known in the U.S. as SAE AS9103, “Variation Management of Key Characteristics”). The current (lean) requirement for configuration management in subclause 4.3 is also under review, and additional coverage of this topic should be expected in the revision. There were also requests for new requirements related to risk management. These varied in the depth and breadth of the risk coverage. Some favored a packaged risk management clause; others that various elements of risk be embedded in appropriate clauses throughout the standard. A subteam has been formed to review all requests and develop a recommendation. Due to the complex nature of most aerospace products, and global sourcing and partnering at multiple levels of the supply chain, a requirement for project management is under discussion. Some emphasis on this topic can be expected in the revised 9100 standard. One subteam is reviewing requests for the addition of requirements for key performance indicators; another subteam is determining whether there’s an opportunity to codify any continual improvement methodologies to supplement the existing requirements outlined in subclause 8.5.1. Of interest was a small groundswell of opinion from users requesting that the term “quality” be dropped from the title of the standard. This was based on the recognition that, with the wide use of business excellence models and other management models and tools, we’re closing in on the time when the QMS may have to expand to be an overall “enterprise” or “integrated” management system. Because 9100 is an ISO 9001-based standard, these requests are obviously out of scope and beyond the control of the 9100 Team. However, the issue will undoubtedly be the subject of ISO technical committee work in the future. In addition to expected editorial and technical changes, the industry scope of the 9100 standard will be expanding in the next revision. Recognizing that many of the major aerospace companies have defense divisions, and that there’s great similarity between land- and sea-based defense systems and aerospace systems, the charter of the IAQG was recently revised to include organizations that provide land- and sea-based systems for defense applications. As a result, 9100’s title and foreword will be revised to indicate applicability of the standard to the aviation, space and defense industries. The preceding is a brief description of some of the noteworthy subjects identified by the data mining process. The 340 comments received covered many of the clauses of the standard and, given such comprehensive criticism, the entire standard is under review. The desired end state is to learn from the past seven years of stakeholder experience, to clarify and improve existing aerospace requirements where necessary, and to add new requirements only when they provide value to the QMS. This effort is likely to enhance product conformity and demonstrate that the benefits of implementation will outweigh implementation costs. After the Melbourne meeting in April, work will begin on translating the intent of accepted revisions into written requirements and preparing a first draft. Review and refinement of the first draft is scheduled to occur from late 2007 to early 2008. Coordination and ballot of the revised standard are scheduled to occur later in 2008 and into 2009. As announced at the November 2006 meeting of ISO/TC 176 in Busan, Korea, the amended ISO 9001:2000 standard is scheduled to be released in May 2009. The IAQG 9100 Team is working to release the 9100 revision as soon as possible after the release of the ISO 9001 standard. Working in the quality field since 1973, Wayne E. Johnson is a quality systems specialist for The Boeing Co., and was a member of the U.S. team that began development of the AS9000 standard in 1995. Engaged continuously since 1995 in developing and deploying the aerospace QMS standards, Johnson is currently the deputy team leader for the IAQG 9100 Team.